Blood pressure is written as two numbers; for example, 120 over 80 mm Hg. The first number is the systolic pressure. This is the pressure in the arteries when the heart beats and fills them with blood. The second number is the diastolic pressure. This is the pressure in the arteries when the heart rests between beats. 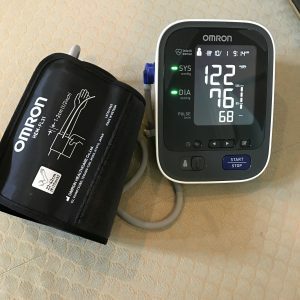 Orthostatic hypotension is defined as a fall in systolic blood pressure (top number) of at least 20 mm Hg or diastolic blood pressure (bottom number) of at least 10 mm Hg when a person stands. (In many cases this drop can be far more significant.) This drop in blood pressure is caused by delayed constriction of blood vessels in the lower body, which normally occurs to maintain an adequate blood pressure when changing to a standing position. As a result, blood pools in the blood vessels of the legs for a longer period, and less is returned to the heart, thereby leading to a reduced cardiac output. Low blood pressure causes the feeling of light headedness and can lead to fainting. This condition contributes significantly to the risk of falling and injury (as if PD doesn’t cause enough problems on its own). Approximately 1 in 5 people with Parkinson’s have OH, and when OH is associated with a nervous system disorder, it is called neurogenic orthostatic hypotension (nOH). When you have nOH, researchers believe the underlying cause is that the body does not release enough norepinephrine. Be aware that a lot of the recent attention to nOH on the web and at conferences is educational marketing by Lundbeck Pharmaceuticals, which has a vested interest in marketing their prescription drug, Northera. The informational website nOHMatters.com has some useful information, but is essentially educational marketing by a pharmaceutical company. There’s no real magic bullet for treating OH, but there are some strategies to help manage it. Key strategies are postural adjustments, blood volume expansion, medications/lifestyle to constrict blood vessels, compression garments and exercise. I am not a doctor, and this is not medical advice. Consider these suggestions/strategies to be potential areas of discussion with your doctor. Avoid rising to a standing position too quickly. When getting out of bed, start by moving to a seated position first. Wait some period of time before slowly leaning into a stand. Similarly, when getting out of a car, keep your body supported and slowly rise out of the car. Many sources recommend elevating the head of your bed by 10 to 20 degrees or 4 inches (10 cm) to decrease nighttime hypertension (high BP), which should reduce the degree of blood pressure drop when rising. If you are exercising or exerting yourself in the heat, you will need even more water to stay hydrated. Increase salt/sodium intake. obviously, you need to talk to your doctor about this first. Sodium increases fluid retention. Maintain a high potassium diet, as high sodium intake promotes potassium loss. Eat bananas. Alcohol dilates blood vessels and dehydrates. Most sources recommend avoiding and/or limiting alcohol. If drinking alcohol, it is extremely important to also drink water. Caffeine has different effects on different people. It is dehydrating, so if consuming caffeine, additional water intake is essential. It is generally thought that caffeine dilates blood vessels, which would make it bad for orthostatic hypotension. However, caffeine generally raises blood pressure, which may be helpful for some cases of OH. There are some theories that caffeine primarily dilates smaller capillaries, as opposed to the major blood vessels. Bottom line: Listen to your body, and pay attention to how your body reacts, you may need to avoid caffeine, or you may need your daily fix. A recent Michael J. Fox Foundation webinar recommends avoiding hot liquids. Hot liquids too generally promote blood vessel dilation, while cold liquids promote constriction. Caffeine drinkers with OH may want to consider cold beverage options. Prescription drugs that are often considered for treatment include Fludrocortisone (Florinef), Midodrine (ProAmatine), Droxidopa (Northera), Octreotide and Pyridostigmine. See the references at the bottom of this article for links to research papers that provide more details on these medications. Above all else, stay hydrated. Exercise in hot weather or that causes excessive sweating can lower blood pressure. Take breaks, as necessary, when exercising. Rapidly drink 16 ounces (500 ml) of water before exercise. Sustained vigorous exercise may lower blood pressure. Take breaks and stay hydrated. OH will make it more difficult to improve conditioning and stamina. Mild physical exercise improves orthostatic tolerance by reducing venous pooling and increasing plasma volume. Because upright exercise may increase the drop in blood pressure, training in a seated or horizontal position (eg, swimming, stationary biking, seated/bench weight training) may be more tolerable. Work with a physical therapist or personal trainer that can help design an exercise program that will offer you the maximum benefit. When OH is associated with a neurological condition like Parkinson’s Disease, it is considered to be an autonomic nervous system disorder. Just as there are neurologists that specialize in movement disorders, there are physicians that specialize in autonomic disorders.A list of clinicians and centers specializing in the evaluation and management of patients with autonomic disorders can be found at the American Autonomic Society Website (http://www.americanautonomicsociety.org/). Next Next post: How Much Should I Exercise for PD?